Cleansing will always be my favourite step in my skincare routine, morning or night, there's nothing quite so lovely as making your skin feel fresher. The Grace Gentle Cleanser works to clear impurities and remove makeup, with a dermatologically approved organic formula and a light-weight consistency that is easy to apply and massage into skin. It uses anti-inflammatory and antioxidant Vinanza Oxifend, an ingredient naturally extracted from Pinot Noir Grapes, alongside nutrient-rich Avocado Oil and Marigold Flower. It's a lovely cleanser to use both morning and night and works really well with my dehydrated skin, which has been more sensitive throughout my pregnancy. It managed to thoroughly cleanse my skin without stripping it, leaving my skin feels cleaner, fresher and softer too. Toners are a step in your skincare routine that you never really understand the importance of, but you can certainly tell the difference when you skip this step. I love my toners just as much as I love my cleansers and like to use toners to exfoliate, to hydrate, to refresh and to clarify my skin. The Resurrect Clarifying Facial Toner is a lovely refreshing toner, best suited to oily skin, which utilises Chamomile, Sage and Lavender Water, which a beautifully soothing scent. It works to add a moisture boost whilst soothing skin, toning skin whilst helping to soften the appearance of visible pores. I also really love the spray applicator for this toner, which gives a lovely mist over my face and decolletage with just a couple of spritzes. I'm someone that believes SPF is important all year round and a good facial SPF is hard to come by; you want one that isn't greasy or too thick, that can be worn with or without makeup and one which feels weightless on your skin. Immortal Natural Sun Protection Face & Body Moisturiser is the perfect option, with a light-weight formula that not only protects your face and body from harmful UVA rays and UVB sunlight with an SPF15 but manages to keep your skin feeling moisturised at the same time using a powerful plant-based Hyaluronic Acid. There's also super-antioxidant Vinanza Performance Plus Grape and Kiwi extract, which works to reduce redness and the effects of excess melanin production, which can lead to freckles and age spots. Eye cream seems to be a step that some people leave, but I personally couldn't be without. The skin under our eyes is so delicate compared to the rest of our face or body and it needs extra care, particularly the older we get. 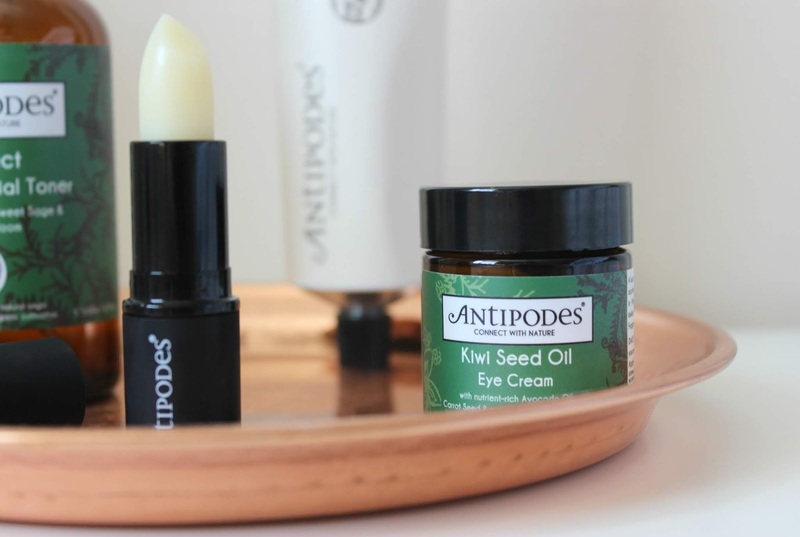 I like to use eye cream both morning and night and for daytime, the Kiwi Seed Oil Eye Cream has been absolutely perfect, as it has a lovely light-weight formula which cools and soothes tired eyes, particularly good for me, as I am getting less sleep than usual due to my second pregnancy, particularly in this summer heatwave! The formula is infused with ultra-rich concentrations of Vitamin C, from Kiwi Fruit Seed, alongside Carrot Seed Oil, Aloe Gel and pure Avocado Oil, alongside a blend of Essential Fatty Acids, Omegas and vital vitamins. Together, this powerful formula works to soothe and hydrate, giving your under eye a brighter, more youthful and refreshed look. Good lip balms are really underrated in my opinion. 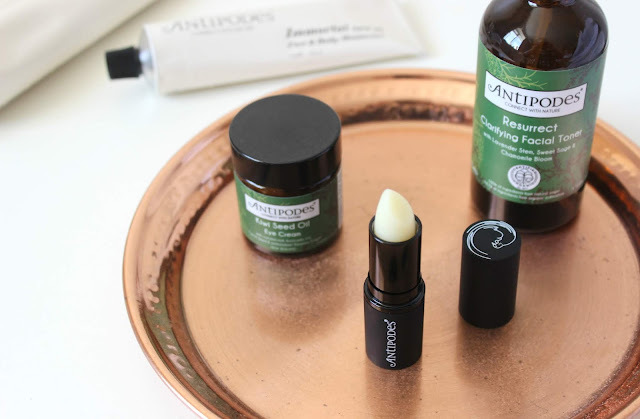 Whereas in my teens I used to buy the pocket-money petroleum filled options available on the high-street, I find my lips are overall kept in a much healthier and happier condition when I use something with better ingredients, formulated to actually benefit my lips. The Kiwi Seed Oil Lip Conditioner uses a nourishing formula with a Kiwi Seed Oil, Avocado Oil, Vitamin C and Omega 3, gliding on with ease and instantly leaving my lips feeling softer and hydrated. Over continued use I've found my lips overall feel plumper and moisturised, making lipstick application a breeze! Are you tempted to add any of these Antipodes products into your daily skincare routine or perhaps you have a favourite Antipodes product you think I should try? 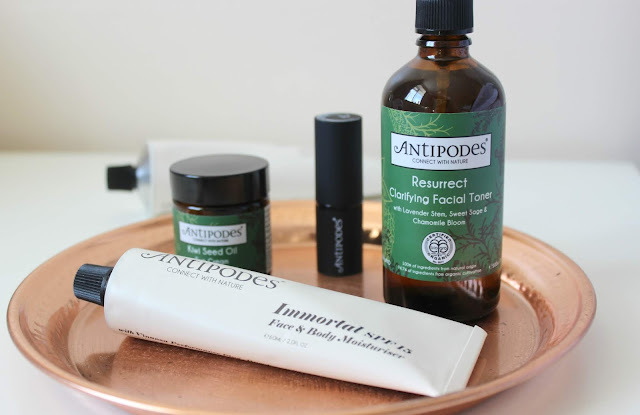 Let me know and for more info on Antipodes and their vast skincare, body care and makeup range, head to www.antipodesnature.com. if only the SPF on that moisturiser was higher, I'd be buying it for sure. 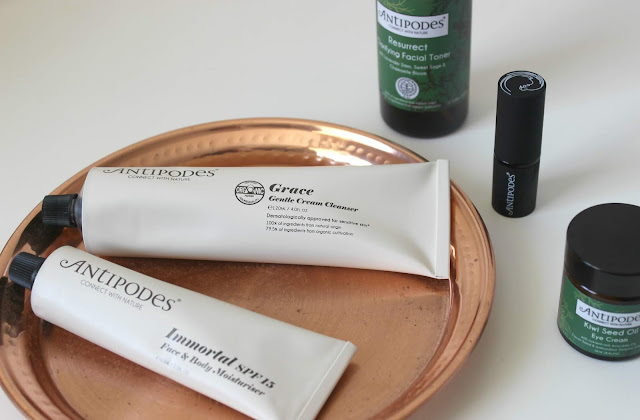 Antipodes has some of the most gorgeous packaging around, and I have my eye on that cleanser! There's something so pleasing about the tube and the font. I also love the sound of the toner, I love a good spritz and it's one of my favourite parts of my routine. Thank you for sharing our premium natural and certified organic and vegan skincare Sophia! We're delighted you enjoy it!